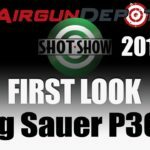 SHOT show 2019, Im at the Sig Air booth giving you a first look at the sig P365 ASP. Now this is a replica of the P365 which is one of the most exciting compact handguns on the market, they’re selling like crazy so it’s exciting to see a replica come out. Now this is a CO2 replica and you wonder how a CO2 cartridge it fits in there, but it and it really does take up the whole grip there. In spite of that incredibly compact size, you still have blowback, you have field-stripped capability, you have a 12 round drop-down magazine, and the cost is only a $100. We’re expecting to see these sometime in May or June. Stay tuned for more SHOT show coverage.